In 2014, a monthly series of public forums and ‘Ōlelo television broadcasts helped build public awareness and create a better understanding among both Hawaiians and non-Hawaiians about what the sovereignty movement means for all the people of Hawaii. Hawaiian sovereignty will affect everybody in the state. The series was timed to precede the Native Hawaiian convention to organize a modern Hawaiian government. Guests are Governor John Waiheʻe and Robin Danner of the Kanʻiolowalu Commission, Leon Siu, and Poka Laenui. MUST SEE! 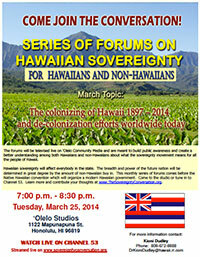 See also ‘Ōlelo TV Schedule » (search for Sovereignty Conversation). This monthly show on ‘Ōlelo explores diverse thinking about sovereignty and the forms it could take by talking with diverse sovereignty thought leaders. Hosted by Maile Alau, Executive Director of Hawaii Maoli, the nonprofit partner of the Association of Hawaiian Civic Clubs. This series, also on ‘Ōlelo, focuses on information and issues that are most important to Hawaiians as they look ahead to governing themselves as a nation. The first show in the series, for example, focused on building the Hawaiian agricultural community.